Respondents to ARTBA’s “Quarterly Market Conditions Survey” reported a pullback in state bids for contract work in the first quarter of 2014, indicating uncertainty surrounding the Highway Trust Fund (HTF) is starting to have an impact on contractors. Although the overall amount of work performed in the first quarter was about the same or down for 77 percent of respondents compared to the first quarter of 2013, some contractors indicated an increased demand for construction work in the wake of damage done to the nation’s transportation infrastructure over the unusually long winter. Unless Congress provides additional funding for the HTF, which supports the federal aid highway program, all incoming revenues will be used to pay for ongoing projects. There will not be enough funds to support any new federal-aid projects in fiscal year 2015, which starts October 1. 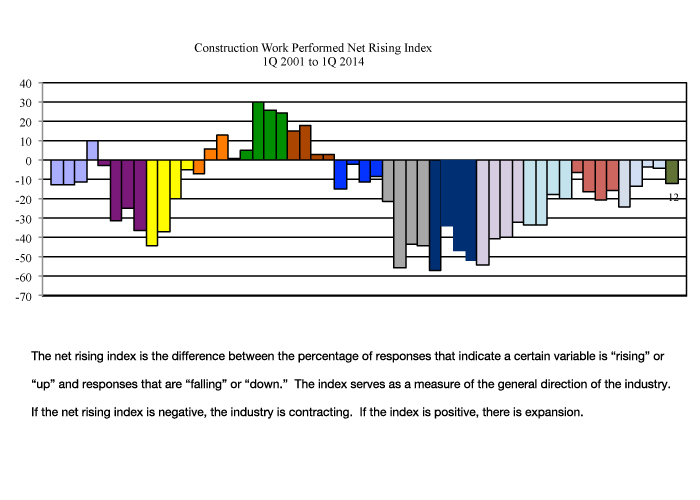 The market outlook for 2014 remains mixed—with most contractors, 55 percent, expecting sluggish growth. Over one-third of respondents said the amount of construction work they performed was down in the first quarter of 2014 compared to the same time period last year. This was likely due in part to the severe weather— two-thirds of survey respondents reported delays due to weather, while 37 percent reported design or owner-related problems. Rising material prices and wages continue to squeeze profits. Profits margins are about the same for 46 percent of contractors and down for 39 percent of respondents, the survey found. On a positive note, nearly 48 percent of contractors reported higher backlogs at the end of March 2014 compared to the end of March 2013. This is good news since 79 percent of respondents said they have significant capacity to increase construction work above their current level. The full results of the survey are available to survey participants and ARTBA subscribers. For more information, contact Lital Shair.